at CD Baby! You can listen to samples there too. Also, get these fabulous Lolas t-shirts, baseball jerseys and trucker hats at Café Press. is now available on Jam Records, featuring 15 brand new original songs by the Timmeh. The best way to get it is to order directly from Jam. Jump to the sounds page to hear an mp3 from the new album! March 7 2004: The Lolas play Nashville IPO at The End. Our set start time is 9:00 pm. 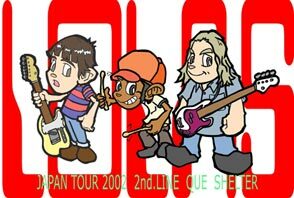 In November 2002 the Lolas made a week long tour of Japan. We had an incredible time, everybody was super nice! Nudge 'Em All, Rocket K, Eleki Bass, Short Circuit, Nine Six Down. the first Lolas LP from 1999. 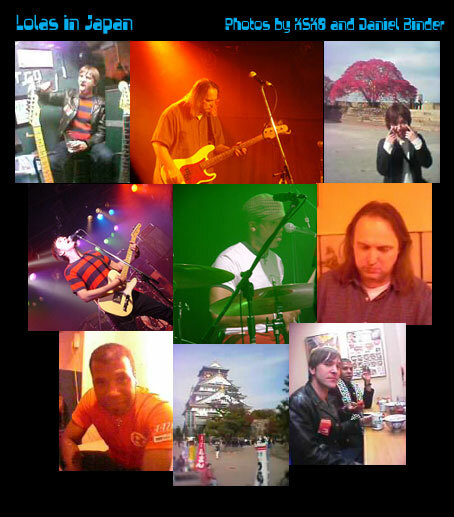 We had a blast at all the shows. They would have a party in the clubs afterwards. Japanese fans are on the case when it comes to partying, no lie. Japan is an amazing country, quite different from the USA. (the drinking age is 12). 7"s available from Wizzard In Vinyl. See lots more Photos here . Check back for more updates! !